A week after very nearly knocking off Ohio State from its perch at No. 3, Baylor falls by the wayside with a loss to Oklahoma State. Bad news for the Bears, and good news for the Buckeyes, which can slide comfortably into the No. 3 spot knowing they’re without equal when it comes to a ‘replacement’ pick for the title game. Now with more than just a handful of once-beaten teams on the BCS roster, the voters will have some choosing to do. Surprisingly, Oregon no longer counts among the once-beaten after losing to Arizona, but a handful of Tigers, plus many more do still have that one-loss sheen. Last week’s No. 6, Auburn, likely makes that leap into the top-four, thanking Baylor and Oregon on its way up. After that, Clemson and Missouri will battle it out for No. 5 — that race should be somewhat closer this week than it was last as the voting pieces are placed back to teams somewhat haphazardly. Oklahoma State and Stanford will in the discussion, too, thanking Texas A&M for not making their lives quite as difficult as they could be. Oh, and Ohio State could finally get some Big Ten company in the top-12 with the emergence of Michigan State, mostly moving up because other teams are getting out of the way, fast. Remember, we’ll be here to take you through all of it, starting with tomorrow’s releases of the human polls, computer rankings and BCS. Follow along all day @BCSKnowHow and here to stay up to the second with projections, mathematical breakdowns of the computers, human polls and everything in between. Then follow along this week as we break down scenarios and implications. All six computers seem to enjoy Notre Dame’s resume of work, the Fighting Irish are elected to the No. 1 position in all of the computers this week. Florida, gets the equivalent of a unanimous No. 2 vote from the computers, with Billingsley being the only outlier, placing the Gators at No. 6. 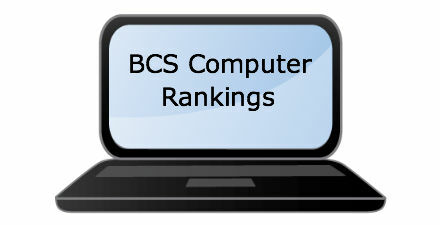 But because the BCS eliminates the highest and lowest rankings from the computers, the Gators are mostly unaffected by that slight difference. Let it never be said the BCS didn’t give us drama. With a clear-cut, simple equation for the BCS title game seemingly resting on the table just a weekend ago, the events of late Saturday night threw the BCS back into chaos, and now promises us yet another drama-filled final two weekends of college football. Losses by Kansas State and Oregon open the BCS up again and Notre Dame proves the one to take advantage, as the Irish claim their first-ever BCS No. 1 ranking in the sixth iteration of the rankings in 2012. Alabama, thought to be out of the running just a week ago, is now squarely back in the title picture at No. 2, needing just to win out to get back to the title game again. In order to win out, however, the once-beaten Tide will have to contend with No. 3 Georgia, which claimed that spot in both polls Sunday afternoon. Georgia’s spot outside the top two is a moot point if the Bulldogs can win next weekend and then beat the Crimson Tide. Georgia will be BCS title game bound if they beat No. 2 Alabama in the SEC Championship Game. The SEC rounds out the top four with Florida, boosted by a strong computer ranking to No. 4. Florida is still hoping for some upset ahead of them, but have set themselves up nicely for a BCS bowl bid, either by virtue of their single loss or by the BCS selection process that would select the Gators for a BCS bowl if they finish as No. 3 and the SEC champion plays for the BCS title. Now-once-beaten Oregon and Kansas State land at No. 5 and No. 6 respectively, with Oregon hampered by an already poor computer aggregate before their first loss and Kansas State bolstered by computer support that didn’t waver much despite a tough loss to Baylor. The SEC is back at it again at No. 7, as LSU grabs the distinction as highest-ranked two-loss team in the nation. Just behind the Tigers sit the newly top-10 Stanford Cardinal. Stanford lands firmly inside the top 10 after a victory over Oregon this weekend. Texas A&M restarts the SEC conga line at No. 9, with No. 12 South Carolina rounding out the unprecedented presence of the SEC in the BCS top 12. Florida State still languishes at No. 10 despite huge support on the poll side, with Clemson equally getting hammered by the computers. So. Two weeks sure to be drama-filled and heart breaking for some remain. We’re far from done with the BCS, the season or the various implications that will be in store for the weekends to come. 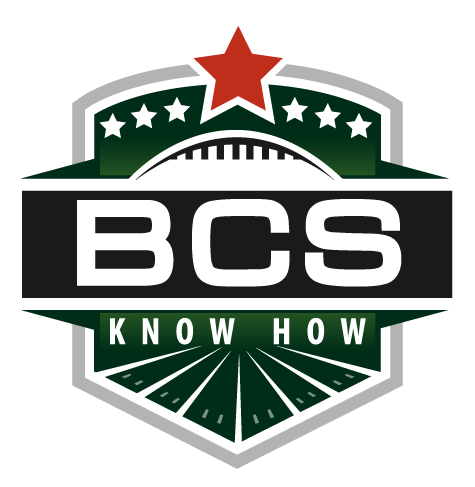 Be sure to stay tuned to BCS Know How and @BCSKnowHow throughout these final few weeks for all the latest analysis and news. Some good, some bad. Top four, which are the important ones, were good. A mixed bag moving down. The real thing to key on is Florida State’s continued lag. It’s real and it’s here to stay unless the Seminoles can top the Gators. Two weekends and three major upsets — November BCS chaos has struck again in 2012. Who is left standing? This mid-November weekend it was BCS No. 1 Kansas State and No. 2 Oregon that took the fall, leaving us anticipating a set of BCS rankings that will not resemble anything we’ve seen to this point. When we finally do get these sixth BCS rankings, it will be the Notre Dame Fighting Irish that paces the rest of the FBS world. Yes, the 11-0 Irish will stake a claim to a top ranking in the BCS with just one test remaining, that being against USC next weekend. Win, and the Irish can make their first appearance in a national championship game in the BCS era. 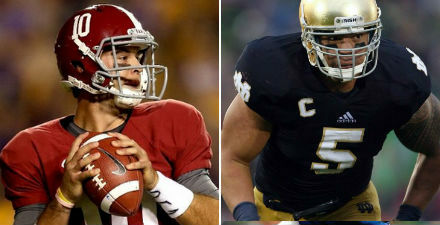 That’s the luxury of the BCS’s top spot, and the Irish will be solidly there. But lo and behold, right back in the conversation and again controlling their own destiny for a BCS title game berth will be tomorrow’s No. 2, Alabama. The Tide fell just to No. 4 after their shocking loss to Texas A&M last weekend, and despite a lopsided victory over an FCS team, the Tide will prosper greatly because of what happened around them. The Tide had started an unprecedented grouping of six SEC teams in a row in spots four through nine in last week’s BCS rankings. This weekend, the group will spread out a bit, but not before two SEC squads — the Georgia Bulldogs and Florida Gators — take the No. 3 and No. 4 spots in the BCS rankings tomorrow. Kansas State will interrupt the SEC party at No. 5, keeping a strong computer ranking after falling to a respectable Baylor squad. Oregon lands at the same general spot, given its loss to previously BCS No. 13 Stanford. The SEC grabs two more spots in the top eight, with LSU and Texas A&M, before Stanford and Florida State round out the top 10. South Carolina and Oklahoma complete the top 12. Remember, we’ll be here to take you through all of it, starting with tomorrow’s releases of the human polls, computer rankings and BCS. Follow along all day tomorrow @BCSKnowHow and right here to stay up to the second with projections, mathematical breakdowns of the computers, human polls and everything in between. Then follow along this week as we break down scenarios and implications. Got all that? Hope so. Odd week. Got the tumble at the top, botched the tumble at the bottom. Boise State gets the help they’ve desperately needed these past few weeks in the computers, with more to come. Their boost for beating Fresno State was nice, and closed the gap between them and the TCU Horned Frogs to a very close .0135 margin. But the real change to watch will come next week when the Broncos will be assessed on the strength of their win over Nevada as well. The two wins combined could give the Broncos enough to jump TCU in next week’s BCS standings. You’ll want to stay tuned for that.